As a cohort of patients, the number of looked after children is not great, but their needs certainly are. At last count, there were more than 92,000 in the UK, the highest number since the mid-1980s. Nearly half will have a mental health disorder and two thirds will have a physical health complaint. Yet, despite this, there are worrying gaps in the services being provided for them, according to latest research. A survey of 158 nurses working with looked-after children carried out by the RCN earlier this year has concluded that in too many areas they are receiving a ‘poor or limited service’. The poll highlights ‘considerable variation’ across the country in the ways that services are set up and in nursing workloads. While nine out of ten nurses reported that their areas have a dedicated designated nurse for looked after children, in some places this role is twinned with the safeguarding post, while in others the role falls between being part-commissioner and part-provider. Just over two thirds of respondents reported that there is a dedicated named nurse to work with looked-after children. In areas that have one, caseloads vary between 50 and 150, with the study saying that the system is being ‘hampered by a lack of investment’ and poor communication with social care departments. Central London Community Health Care NHS Trust looked after children nurse consultant Lin Graham-Ray says this is concerning. ‘I don’t think we have moved forward quickly enough in recent years. Designated looked after children’s nurse in Cornwall Liz Allan agrees. She says that many see health care as the Cinderella service compared with safeguarding. She adds that, as a specialty, it is relatively new: it is only over the past decade or so that areas have set up their own dedicated teams. She thinks that the current system puts an ‘overwhelming emphasis’ on the health assessment that each looked after child should have without properly planning how to support their needs afterwards. ‘In some areas, the delivery of the health assessment is seen as the be all and end all, but then there is not the capacity for ongoing support and monitoring to ensure that the children get the help they need. ‘What is becoming increasingly clear is that there is a need for a specialist looked after children’s service. In Cornwall, we have a specialist health service that co-ordinates care. We liaise with other services and act as an advocate for the children. The importance of developing specialist services is also recognised in two recent pieces of guidance. In March, the Department of Health and Department for Education produced statutory guidance for services in England, which updates previous recommendations. The guidance says that it is the responsibility of CCGs and NHS England to work with local authorities to ensure the health needs of looked after children are met, with a particular emphasis on CCGs to ensure good co-ordination when children move from area to area – as they are prone to do once they are in care. Also published in the same month was updated guidance from the royal colleges of nursing, GPs, and paediatrics and child health. It sets out a list of competencies for all staff – from those who have only a little contact with children in care, such as ensuring that practice nurses have the ability to identify and refer on, to what is expected from those who fill designated posts. This guidance recommends standards that include defined job descriptions for designated and named doctors and nurses, and a minimum ratio of one full-time nurse to 100 looked after children. RCN professional lead for children and young people’s nursing Fiona Smith says: ‘Evidence shows that many children in care credit their specialist nurse above all others with helping them turn their lives around.’ She says that, while ‘nurses work tirelessly to provide the best levels of service’, the survey shows they are being ‘severely let down by a lack of service capacity, role clarity and understanding’. Ms Smith hopes the guidance will begin to change that. ‘Our recommendations lay the groundwork for much-needed improvements and also raise awareness about the importance of health care for looked after children,’ she says. Lin Graham-Ray (pictured) is the country’s longest-serving looked after children’s nurse. 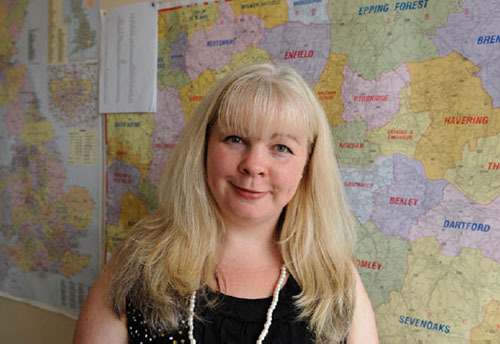 She was appointed in 2000 and is now part of a team of five nurses who work across the London boroughs of Westminster, Hammersmith and Fulham, and Kensington and Chelsea. Her work, along with other early adopters, has helped pioneer the model of care that is today recognised as good practice. She thinks that being a looked after children’s nurse involves more than simply addressing the physical and mental health needs of her patients. Instead, she sees herself as a ‘professional friend’. ‘These children can be very mistrusting of statutory services,’ she says. ‘It takes a lot of time and patience to gain their trust, but you have to or you can’t help them. The benefit of this approach can be seen with the work she did when she was awarded a Florence Nightingale Foundation research scholarship. She produced a booklet, The Story So Far, which includes letters and comments from some of the children she has helped. Their appreciation is clear. One woman, who was in her early twenties when she wrote to Ms Graham-Ray, describes her as the one ‘person in my life that has been constant’, while another explains how she was the person she turned to when she was became pregnant at 15. Ms Graham-Ray, who won the Nursing Standard Nurse of the Year award in 2009, says: ‘One of the key things to building a good relationship is how you introduce yourself. ‘Research shows that people make up their minds quickly after meeting you. So I am always upfront, I tell them that anything they tell me is confidential, but that it stretches only so far. If they tell me something that worries me, I tell them I may have to act. ‘A good health assessment is also essential. That may mean meeting them on their own terms. I have known nurses do health assessments at trampoline centres, at football matches, and my favourite is when one of my colleagues did one sitting under a table, eating marmalade sandwiches with the pet hamster. There were 92,728 looked after children in 2013 in the UK, more than 68,000 of whom were in England. The number includes children who are living with their parents under voluntary agreements, those who are subject to care orders or emergency orders for their protection, children who are compulsorily accommodated, and also unaccompanied asylum seekers. Most looked after children – nearly two thirds – are in care because of abuse or neglect. About 45% of those aged five to 15 years have mental health disorders, which rises to nearly two thirds of those living in residential care compared with 10% of the general population. Two thirds of looked after children have been found to have at least one physical health complaint, such as speech and language problems, co-ordination difficulties and eye or sight problems.